Symbologically though this is kind of a mess. If its name is a pun on “I won't smoke,” why is it smoking? Is that look on Elephant’s face oblivious or malicious? If Swan hates Elephant’s secondhand smoke so much, why doesn't he just get off Elephant’s back? If Elephant’s trunk is a cigarette, is it reasonable to place restrictions on how he uses it? (Can he even breathe any other way?) 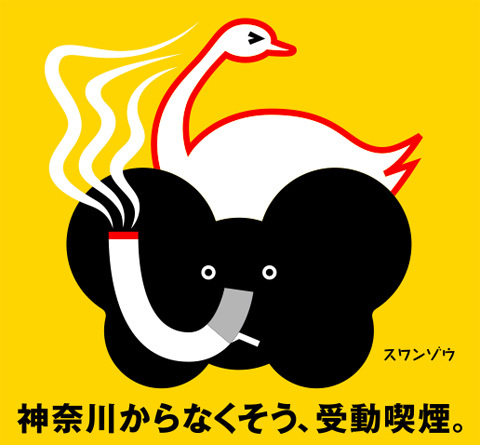 And of course there's the weird sense, created by the color scheme, that the trunk/cigarette is actually part of Swan, somehow poking through Elephant.